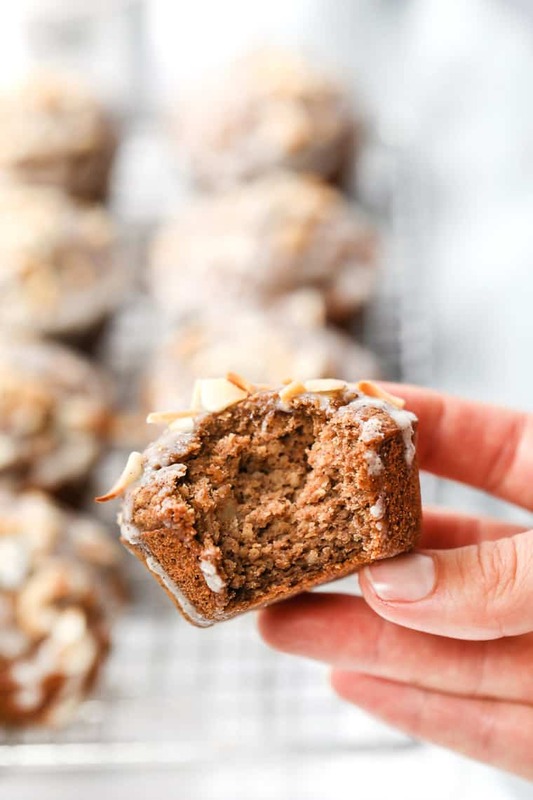 These healthy quinoa flour muffins use a blend of whole grain flours like oat, quinoa, and almond to create a delicious muffin. Flavored with chai spices and topped with a delicious vegan icing! When I was younger I used to love the chai lattes from Starbucks. They were like my favorite thing ever. They were super sweet, full of amazing flavor and I felt so fancy drinking them. Nowadays? I've realized how much sugar those drinks actually have, so I tend to skip them in favor of a cappuccino instead. But that love for chai spiced things hasn't escaped me. It's still one of those blends that I just adore! 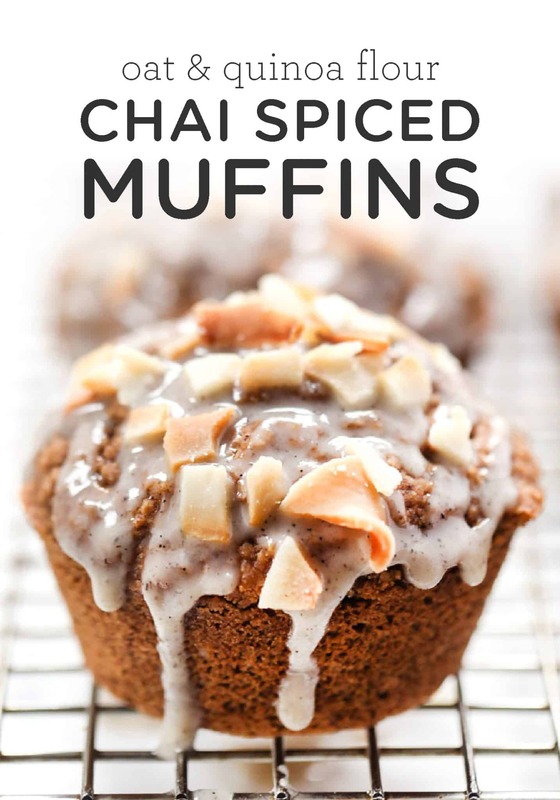 So today we're going to make our own DIY chai spice blend and stirring it into one of my other favorite morning treats: muffins! Quinoa flour muffins to be exact that are gluten-free, vegan, oil-free and healthy. Life is sounds pretty dang amazing right about now, don't you think!? I've actually always wondered that myself! Typically when I make chai flavored things, I use chai tea bags that I steep into a strong liquid, but for these quinoa flour muffins, I wanted to use the actual spices. Sometimes you'll also see some black pepper thrown in there, but for baking, I like to leave that out. It's fabulous if you're using in a smoothie or something that can handle an extra kick, but for these muffins, we're sticking with the standard blend. The next thing we need to discuss is icing. I've found it super challenging to find a recipe for a healthy icing as the main component in icing is powdered sugar. 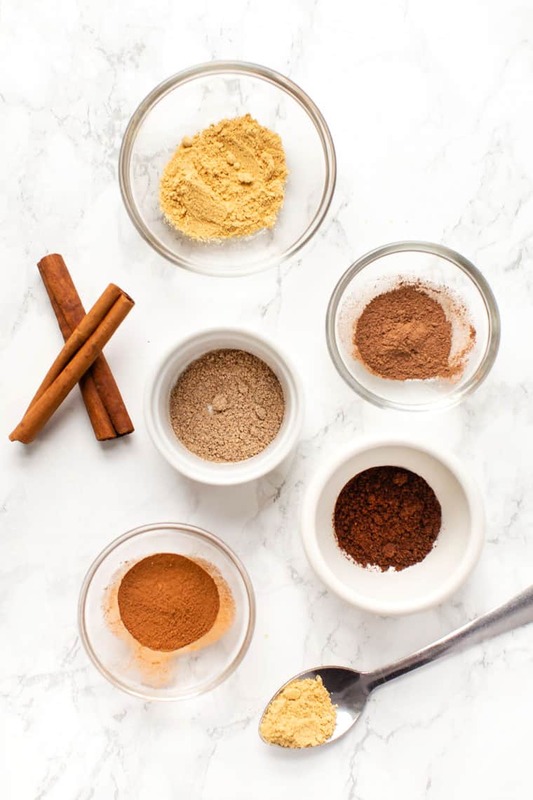 Powdered sugar can be fine in doses, but it's not something I keep in my pantry, nor do I feel like it's something I want to add to my breakfast foods. Because after all muffins are meant for breakfast! So I have finally found my solution: COCONUT BUTTER! Coconut butter on its own is mildly sweet and to me as an almost frosting-like taste. But when melted? It makes a fabulous vegan icing/glaze. All you need to do is melt you coconut butter in the microwave or on the stove until it's a drizzlable texture. If it doesn't loosen up, add in some MCT oil until you get the texture. If you've made any of my other muffin recipes before, then you know I'm a big fan of this flour combo. Oat flour makes things a little chewy, but also very moist and springy. Almond flour provides healthy fats which help to keep things cakey and a little lighter. With that blend, we're also doing a few more things to make these muffins really healthy. We're using applesauce to replace some sugar and oil, sweetening with maple syrup instead of refined sugar and we've also added in some apple cider vinegar to make them nice and fluffy! 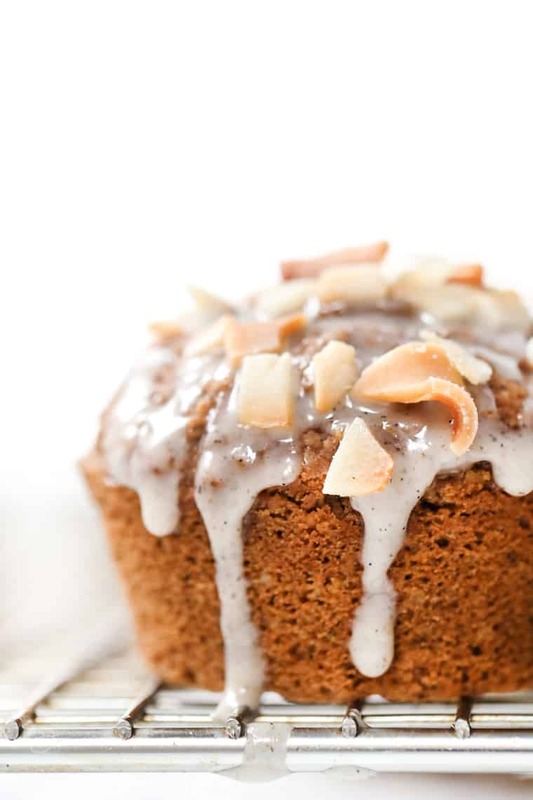 Overall, these chai spiced quinoa flour muffins are a treat you can feel GOOD about! They're full of complex carbohydrates, healthy fats, fiber, and even protein. And I'd definitely say they're an awesome breakfast option! 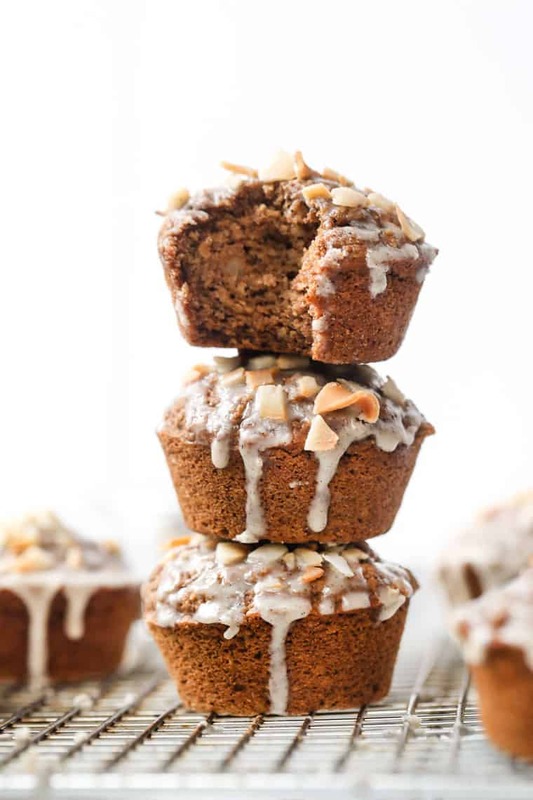 These healthy quinoa flour muffins use a blend of whole grain flours like oat, quinoa and almond to create a delicious muffin. 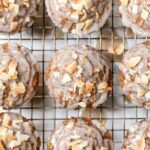 Flavored with chai spices and topped with a delicious vegan icing! Heat the oven to 350ºF. Grease a 12-cup muffin tin and set aside. Combine the flax and water and set aside to gel while you prepare the remaining ingredients. In a small bowl, beat together applesauce, milk and syrup. Whisk in flax egg. Add the dry ingredients directly into the bowl with the wet and stir to thoroughly combine. Fill each cup 3/4 of the way full and let rest for 5 minutes before baking. Bake on the center rack for 24 - 26 minutes until a cake tester inserted into the center comes out clean. Cool in the pan for 2 - 3 minutes, then transfer to a wire rack and cool completely. Resist the urge to not break into them; cooling them will allow everything to set properly. Drizzle on coconut butter if using and enjoy! If desired, reheat in the toaster oven or in the microwave. These look absolutely delicious!! I’ve been meaning to ask you, and I know it’s a crazy question given your blog name! But I’m highly sensitive to quinoa, so I avoid using it in recipes. Such a bummer, because I love the taste of it, but it causes me such pain! What do you recommend as a substitute for quinoa flakes? Thank you! Oops I meant to say what should I use in place for the quinoa flour? I have seen some recipes that call for quinoa flakes, but I haven’t made either of those types of recipes because of the quinoa flakes or flour ingredients. I’d love to know of a substitute! I’m gluten free as well!